Dupplin Estate Sawmill supplies a wide range of timber products to a variety of customers in the Perth area. From well seasoned firewood delivered to your door, to specialist cuts of wood and fencing materials, we are able to supply you with timber of the highest quality. All of our products are sourced from our own woodlands on the Dupplin Estate, 5 miles to the west of Perth. Click on the link below to see our current list of timber and fencing products. 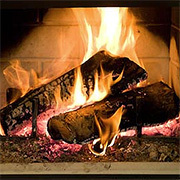 We deliver seasoned hardwood logs; softwood logs and kindling direct to our customers. All firewood is sourced from our own woodlands. Need timber for a special project—Treehouses; Storage Barns; Timber Homes; Sheds; Garages; Wall Cladding? Contact us on 01738 622757 to discuss your requirements.